LUHANSK, Ukraine -- Personnel carrier bearing blue circle and yellow writing of peacekeepers was seen after Ukrainian convoy was destroyed. 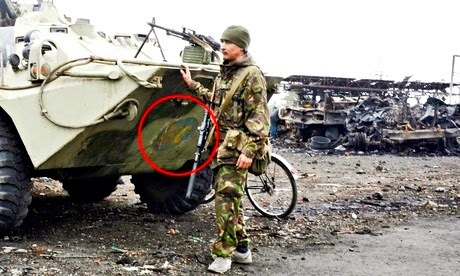 A pro-Russia soldier seen near an APC with the mark of peacekeeping troops in Lutuhyne, near Luhansk. The men, who refused to be photographed, said they were from Russia and were not regular soldiers, saying they were paid mercenaries. They did not say who was paying them. Earlier this week, Ukrainian president, Petro Poroshenko, said 70% of Russian forces had already left Ukraine after taking part in a surge against the Ukrainian army that pushed Kiev into signing a ceasefire agreement. Last month, the Guardian witnessed a Russian armoured column cross the border near the Izvaryne border post. Russia denied it had happened, claiming the convoy was a border patrol that stayed on the border. Thanks for sharing! I generally prefer RTS for commercial vehicle wraps and would recommend it to all.